WOWWWWW!!! *sniff sniff* That. Was. Beauuuuuuutiful. The book that gave me big fat ploppy tears that just ran down my cheeks randomly in a mix of sorrow, absolute grief, and pure sweet happiness! From start, to middle to end… I snuffled and sobbed, cheered and giggled, oohed and awwwwed over the various stages of her grief and her emotional healing. I was right there with her, and felt every single step of her mourning. Because that’s what this one was about. Love and loss. And just maybe… love again. Right from the start (even though I went in blind), I knew what I was in for. Like Sherry said, it hurts like heck right from the first few pages, and yet, even though I knew I was in for pure emotional agony, the writing is so beautiful, the characters already so well developed, and the connections and bonds so tangible that I knew I was also in for a delightful, heartfelt treat! I didn’t need “time” to get into it, and get to know them. I was already there, right from the start. And there was NO way I was shying away from these tears. I was gonna feel ’em and let ’em flow. Honest, raw, REAL, heartfelt and even in it’s sorrow… witty as heck! And my fellow readers had this one right! 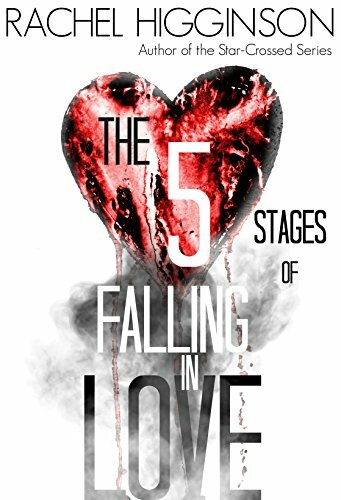 Kandace: The gang and I read Five Stages to Falling in Love this week and we all loved it hard. I think you would like it too. A few of us thought her writing reminded us a bit of Taylor’s writing in After I Do. Every word and thought felt so real. <— Oh and you guys know just how much I LOVED “After I Do“. BEpps: The five stages of falling in love has to be one of my all time favorite books of all time! It is the IT book for 2015!!! Kandace: The words were visceral, touching, real and AMAZING! A true love story. I haven’t connected with a book like this in a long time. I was concerned going it would be too sad but the way this author told the story made it something special. I felt I was right there with her every step of the way. Heck, I could have been her, that’s how real it felt. Maryse: I am LOVING 5 Stages of Falling in Love. Sure, I cry on and off, but I am SO there with them… my face is all streaky and my nose is pink. LOL! Maryse: Welp… I’m back in big fat ploppy tears reading The 5 Stages of Falling in Love, again. *sniff sniff*… *sniff* … waaaaaaaaaiiiilll!!! Christmas. Oh wow. Sherry: Right!!!?? I’m here if you need me !! Maryse: FAT TEARS Sherry!! The kind that come out on their now in big streams and plop on my pajama top and my face doesn’t even change ’cause I’m in sad-shock. You know those tears are something, when they do their own thing and you don’t even have to ugly cry for them to come out…!! Summmer: Aww 5 stages of falling in love was really good I read it last week! It gives the “feels” that’s for sure! Enjoy it! Maryse: Awwwww!!! This has got to be one of the most sweetest, touching realistic “thoughts” out of a book that I’ve ever read. “And next year, Lucy would be starting kindergarten . Because obviously she had stopped loving me. Otherwise she wouldn’t go; she would stay home with me forever and not force me to watch her grow up.” <— *sniff sniff* The tears are gonna start again. I need chocolate. Agreed Cheryl! That is my only complaint… I was taken aback by how quickly it came to an end, so I backed up and re-read those last few pages and savored ’em properly. Once I realized I was at the end of the story, I still found even that part, beautifully written, rush and all. My heart!!! Elizabeth had the perfect life with her wonderful husband Grady, and their four young children. Absolutely in love, and falling more so, every year. But her life came crashing down when he was diagnosed with, and died from, cancer. But he was mine. He was my husband. And now he was sick. “Which won’t be for at least fifty more years,” I reminded him on a sob. *gulp* I needed a hug so bad. My new situation? A rough time? This woman had no idea. She had no idea what it was like to lose the love of her life, let alone manage to get herself and four kids ready and out the door at a reasonable time. …this story wove us through her misery and heartache, isolation, and attempt at “normal” so that her kids wouldn’t suffer, or see her suffering the way she truly was. The truth was I didn’t want it to get better. I didn’t want to stop missing Grady. I didn’t want this pain to recede because that would mean I would be over this. Over him. And I never wanted to be. He was the great love of my life and I was terrified to forget one small detail about him. I don’t know why, but I get that. The agony and pain over the loss, and yet never wanting it to go away so you never forget. *sniff sniff* I have a lump in my throat again. And in that attempt, she meets her new neighbor, Ben (when she goes to retrieve her rambunctious 4 year old out of his pool). Patient and kind and humored by Liz and her children, Ben offers her assistance any way she needs it, becoming a good friend to her along the way. Ben’s text message had helped calm my frantic spirit. He’d managed to pull me out of my darkness and shine a bit of light on me. I closed my eyes and drifted easily to sleep, thankful for my sister that indulged me and for my next door neighbor that could make me smile when I thought I would never smile again. And while Elizabeth appreciates and wants Ben around (he gives her some sort of comfort, and eases the ache when they have late night chats and drink wine together), it is all very innocent since she doesn’t let him too close. After all. She’ll never love anyone again. Not the way she loved Grady. I closed my eyes, completely overcome with devotion for a man I would love forever and beyond. Thinking about Ben in this same context seemed silly. How could any man compare to the husband I’d loved and lost? And Ben is just awesome. AWE-SOME! You’ll see. But you’ll also see how hard it is for her to let him in… and you’ll understand her completely. No matter how awesome Ben is. I loved this book to death! I cried and cried and smiled right through the tears at times. It’s not a book full of twists and surprises… you pretty much already know where you’re going right from the start, and have a good idea where you’ll end up. But, it’s the gorgeous journey getting there, with friends, family, past and present, and the beauty of love that comes in ALL forms. Pure unadulterated warmth. I felt comfortably hugged the entire way through. Do it Tessa. It’s gorgeous! Really loved this book. Past Heaven is wonderful too!! Both beautiful and bittersweet stories. 5 stars!!!! I will! And look! You got your number book for your challenge. Maryse, that’s a perfect description-“Bittersweet.” Loved this book too! The waterworks started with your review! I am going to save this for after Thoughtful. Thanks again everyone for the recommendation! You are on a roll with the 5-star reads. 😉 Sniffing…sobbing…tears…falling in love…sounds *perfect*!! Rachel Higginson has a series (Star-Crossed series) that one lady actually made a nail polish line for. 😀 Okay, a little off topic there but still fun! I just looked it up on Amazon, and the first Star-Crossed book is free! And I had to one-click 5 Stages while I was there, of course…we won’t talk about the fact that I apparently already had it. *snicker* I can’t wait to read this one! Fiddlesticks!!! Maryse has another 5-star read? Have to add that to the ever growing mountain of TBRs…. I think I need to organize them into genres, like the other Michelle did, so when I am in a mood, I can go to one list. This one goes into the “when you need a good cry” list, I guess. I’m such a sucker…. have no impulse control AT ALL…. I am starting Hurricane now…. it’s a rainy, yucky day and Life of Anna just had ANOTHER cringe worthy scene!!!! argh!!! I’m going to take a break from it for a little while and spend some time with a broody fighter and a nerdy mathematician girl. YAY!!! I’m 60% into Hurricane and looooving it!! Get on it guys!!! On my list… Just finished the first 2 books of the Signal Bend series. Wow, what to say. Raw, Extremely Violent, heart breaking and Sinfully hot. The first 2 books are of Lili and Issac. Amazing writing that has you at the edge of your seat. You feel all emotions with the characters. Enjoy! I knew you would love this book and I am so glad you loved it hard! I clicked this because you recommended it and it was on sale, Never have I ever cried through a book (& I am halfway thru it)…..I giggle through some of it but I am crying more (sobbing! )…..sad tears and happy tears. This has great writing to make you feel all of these emotions and I cannot wait to see where the journey takes me. Thanks Maryse!